Early this morning I logged onto www.familysearch.org to look at something on the 1855 NYS Census, when I noticed that there were now 33 collections, instead of the normal 32, in the New York State collection of actual scans of microfilmed records and data bases. 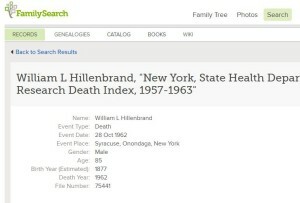 ”New York, State Health Department, Genealogical Research Death Index, 1957-1963″ - Yippee! It has started! 1963 is the current 50 year limit that we must wait to look at the death record index. So perhaps this is precursor to wonderful things to come. Perhaps the 1957 to 1963 chunk is just a trial at LDS or just the first release of all of the remaining death record index listings back to about 1880. Let’s hope so anyway. After quickly looking for some immediate ancestors or family members that might have died during this short period of time, I could not find any, so I did a search on my surname HILLENBRAND and came up with one that I knew a little bit about. having worked on this line for some many years. This is not my immediate family but is a second group that also lived in Syracuse and Onondaga County. Note that you will find a date and place of death, age and an estimated year of birth. More importantly you will find the all important “File Number”. This is what you will need when you apply for a copy of the actual death certificate from the Dept. of Health in Albany. If you apply to a local jurisdiction, city or town clerk’s office, the File Number might not be of any help because I am told that it was assigned in Albany, but it will speed things up for you at state level. As stated previously the NYS Vital Records Division of the NYS Health Department started a collection of official notifications of Births, Deaths and Marriages commencing in 1880. As also reported, many of these are lacking in the early years for what ever reason, but generally speaking from about World War I onward there is a good chance that you will find a record on your Upstate New York Genealogy research in this huge microfiche collection. You may look at the full collection on microfiche at several libraries and locations throughout the state. See previous posts for a listing. The above referenced digital collection is the very first time that I know of that any part of this massive VR Index has been put online and I give major kudos to all parties involved that made this happen. Here is how you can search this online collection. 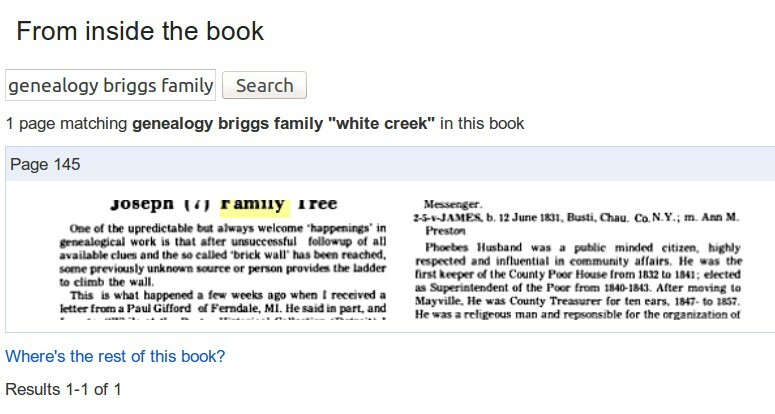 Go to www.familysearch.org. click on: [Search]. Scroll down on the left to: [New York]. Note that this is a compiled data base taken from the microfiche and not copies of the actual fiche. This fabulous news comes on the same day that sad news comes from my friend, F. Richard Barr who just forwarded a blog post written by The Legal Genealogist, about the Closing of the Social Security Death Index (SSDI) until three years after the person’s demise. This act was passed by Congress in the current Budget Bill and is expected to be signed into law by President O’Bama. You can bet that there are people attempting to have this law extended to ALL of the SSDI at some time in the future. Stay vigilant fellow genealogists. We can not allow this to happen! Enjoy the new online Vital Records Death Index. Kip Sperry of Utah is a well known lecturer and author on genealogical and historical subjects. 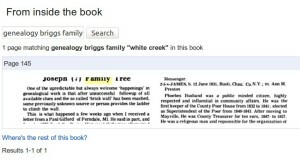 He has created a webpage of very useful links for genealogists. You will no doubt have some new ideas after viewing his site. Bookmark this site or add it to your favorites, and return often.